Posted By: admin 0 Comment before, know, open, Stocks, things, U.S.
1. Stocks surge: U.S. stock indexes look set to build on their record-setting performances. The Dow Jones industrial average and S&P 500 have both added more than 2.5% since the start of the year. The Dow is now trading near the 20,300 point level. The tech-heavy Nasdaq index has also turned in a very strong performance, gaining 6.5% since the start of 2017. 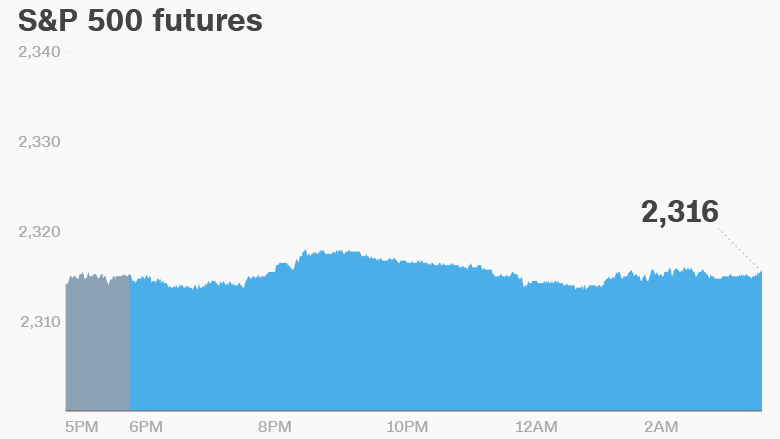 U.S. stock futures were inching up on Monday and could be on track for new all-time highs. Most European and Asian markets were also positive. 2. OPEC oil report: Investors will be watching to see if OPEC cut crude production in January. OPEC and other major producers agreed to slash oil production late last year and it looks like they’re sticking to the plan. Last week, the International Energy Agency announced the cartel was 90% in compliance. OPEC will release its own report on Monday. The agreement to cut production has helped boost crude prices. Crude oil futures are currently trading around $ 53.50 per barrel, more than double their lowest level of 2016. 3. Vote for Trump’s money man: The U.S. Senate is scheduled to vote Monday on whether to confirm Steven Mnuchin as President Trump’s treasury secretary. Mnuchin, whose resume includes time as a Goldman Sachs(GS) banker and a Hollywood film producer, has faced pushback from Democrats throughout the confirmation process. They’ve raised questions about his financial dealings and his time as CEO of OneWest Bank, which has been accused of lending discrimination and unfair foreclosure practices. 4. Stocks to watch: Shares in Toshiba(TOSYY) advanced on reports that it will reveal on Tuesday the extent of losses related to its takeover of a nuclear business in 2015. The Japanese firm had originally said in December that it was expecting billion of dollars in losses, which caused shares to tank and lose more than half their value. The 5% rally on Monday is small compared to losses over the past two months. Shares in Restaurant Brands International(QSR) are set to be in the spotlight as the company reports earnings ahead of the open. The company owns Burger King and the Canadian coffee chain, Tim Hortons. Brexit's existential threat: Who's next?